Unique Creations with Aluminum Extrusions - Alufab Inc.
AluFab prides itself in developing or assisting in the development of “Unique Creations.” If you can think it, we can make it. Please review some of the more unique items we’ve designed, and call us. We can help you too. The frame is constructed out of 1.0″ sq. and 1.0″ x 2.0″ t-slotted, clear anodized, structural aluminum extrusion. This provides a lightweight, yet incredibly strong frame that will not rust, chip or flake. This allows the frame to always look new even long after field use. The wheels are non-marking solid rubber that will not flat spot under static loads. 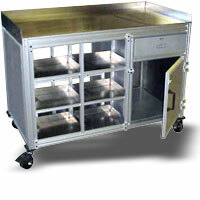 Thus, the wire caddy can be easily moved and can be used in either office conditions or in an outside construction setting. The wire spools are set in 1.0″ dia. J-Hooks that allow for quick and easy set up. Lightweight: Anodized aluminum frame is incredibly strong but light, capable of carrying multiple 250 to 500 ft. wire spools. Portable: By loosening the T-Handle, the frame may be folded and locked allowing for ease of transport and storability in vans, trucks or closets. Adjustable: The T-Slotted aluminum extrusion allows for infinite adjustment on all J-Hooks, braces, wheels and even the vertical wire rack itself. Clean: The clear anodized aluminum will not rust, chip or flake so you never have to paint or “touch-up”. No-Mark Wheels: The heavy duty 6”, non-marking, hard rubber wheels are capable of handling loads up to 600 lbs and will not mar or create flat spots under static loads. 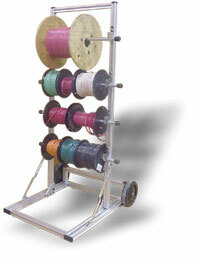 Mobile: The wire caddy may be rolled while holding multiple wire spools or may be folded up and locked allowing for easy transport to and from the worksite. Easily Modified: You may add supports, rack towers, J-Hooks or virtually any industrial bracket using the patented t-slot technology. You may also request specific lengths, widths and heights, depending on your needs. Portable WorkstationThis custom workstation includes a stainless steel top and stainless steel, adjustable shelves, drawer and cabinet. The locking casters allow for easy portability in the unlocked position and a stable work surface in the locked position. 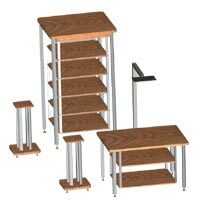 From loudspeaker and television stands, to vibration eliminating racks for high end digital and analog audio equipment, we have products to fit all audio/video applications. Our sleek designs are contemporary and stylish, to fit the needs of decorators, while being sturdy and functional enough to exceed the high performance expectations of serious audiophiles.